Update: now available in the nightly builds! - are you afraid to waste shutter clicks on timelapse or focus stacks? - do you need to take pictures in quiet environments? - do you have problems with mirror vibration (e.g. at very long focal lengths)? - your shutter is worn out so badly that you can no longer take pictures (ERR20)? - old silent picture mode's resolution was too low for these tasks? I believe I've just found the solution to all of the above. I've tried to call a factory test routine: FA_CaptureTestImage (helped by FA_CreateTestImage and FA_DeleteTestImage). At first sight, it did not do anything visible (g3gg0 already tried it years ago), but the diagnostic log and the EDMAC info box revealed the magic: the sensor was sampled at full resolution, without shutter actuation! So, to take an useful image, I went to LiveView first to open the shutter and raise the mirror, then I've paused LiveView (from ML powersave routines, or by going to PLAY mode or Canon menu from LiveView). Then I've called the above routines, and after that, all I had to do was to fill the raw_info structure and save the DNG. If you call these routines without going to LiveView first, the result will be a dark frame (interesting for astro - you can take 300 dark frames without wearing the shutter mechanism). For more details, take a look at this changeset. - The fastest shutter speed I've got is around 1/10 seconds (very rough estimation by comparing brightness from a regular picture). With regular pictures, faster speeds are done via mechanical shutter actuation. - Long exposures are fine up to 15 seconds (longer exposures will crash the camera). - Fastest capture speed: 220ms on 5D3, 320ms on 5D2. This includes a dummy readout, which is probably a bias frame. - So, at least for now, the usefulness is limited to timelapse and medium-long exposures (no moving subjects). - If you use the intervalometer, I recommend taking a picture every 10 or 15 seconds (not faster). Saving DNGs from the camera is slow. - In photo mode, aperture will be most likely wide open, regardless of the setting, because of exposure simulation (enable Expo Override to fix it). Too early to ask. Find a way to speed up the capture process first (see the research section below). However, I don't really expect more than 10 fps (in LV crop mode on 5D3, 1/3.6 of the total sensor area is sampled at 30fps). 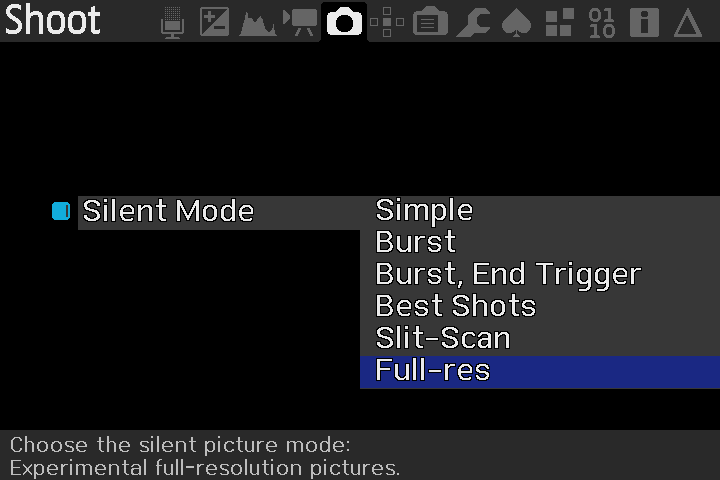 If you implement a burst mode from the current code base, you'll get up to 5 fps. You'll have to judge yourself; I'll just give you some details. - I won't include it in the nightly builds at this stage; early adopters will have to compile it themselves. Download the latest nightly build and enable silent.mo. - How does the camera take a picture? Please do not ask for builds in this thread. This thread is for development related feedback only. If you would like a build compiled, so you can help the Magic Lantern development team by testing this feature and providing feedback, please see this thread. You're an animal! It will be interesting to watch as it progresses. Congrats! a1ex, thanks for your awesome work ! We can put captured frames in mlv container to avoid DNG processing on camera. So it is a solution for time-lapses, not really for astronomy (15s is a bit short), for the moment. BTW I'm pretty sure that it is possible to get same params than a regular picture (exposure duration etc. ), because the Canon LX NR do it (we can do 15mn dark frame for ex.). The question is 'will it be possible in LV'..
@marekk: Yea, that would be great and perfect for the Workflow! Thank you so much A1ex!! Of course. Or full res! 5K VIDEO, HERE WE COME!!!! Awesome news! I look forward to seeing where this could be taken! Wow! Thanks so much, A1ex! Will this work for the 50D? Is there a module I can install to try it out? This is not possible. Try to video mode, shoot one frame using the flash. I want your brain, A1ex.